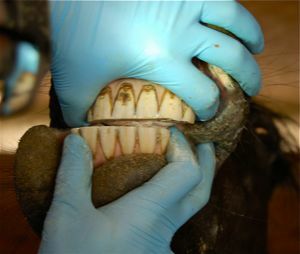 This month we had our Equine Dental Technician come and check the horse's mouths. He works by balancing the whole mouth, both the front and the back - the incisors and molars. The aim is to promote as efficient a molar occlusion as possible. This means that the incisors are at the right length and straightness to allow the molars to come together over the greatest surface area, and in the smoothest grind. When there is a good balance in the mouth, eating is as effortless as possible, and the Temporomandibular Joint of the horse is not straining to bring the molars together, or being blocked by over-long or uneven incisors. Molar occlusion is tested by sliding the jaw laterally, and finding the proportion of the teeth's width the grind is taking place over. This is done for each side of the molars, and the comparison gives an important indication of the overall balance of the mouth. The dentistry we have discovered is another example of our holistic philosophy with our horses. 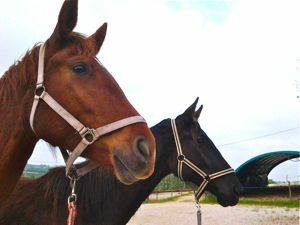 We care about their welfare above anything else, and for that reason we believe we have attracted a dentist who is both conscientious in the way he connects with and handles the horses, and in the excellence of his work. He puts the truth first, and for that reason he continues to develop his understanding of the whole picture. This way of balancing the horse's mouth is another positive spiral, just like holistic foot trimming and holistic horse management. When the whole mouth is balanced, the teeth wear less, and they wear more evenly. They erupt more slowly and need less attention over time, because they self maintain more and more. 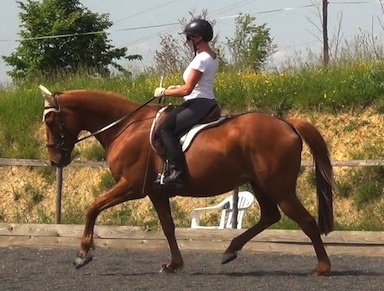 It was very interesting to consider the case studies of our two warmblood fillies, Djinnie and Quaramba. 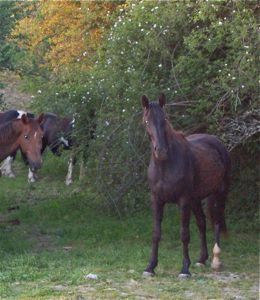 They are both three years old this year, and although they have similar breeding in certain ways, Djinnie (the black) is more 'classical' in type, and Quaramba (the chestnut) more 'modern'. This was reflected in the attention they needed to their mouths. Quaramba turned out to have a broken baby tooth, which was not due to come out yet. 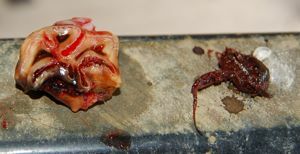 It was beginning to become infected, however, and because she also had a top-heavy and loose wolf tooth - and she will be beginning her training this year - we decided it would be better (for her) to sedate her and remove both teeth. The baby tooth might have fallen out by itself, but on the other hand it might have caused an abscess. Apart from avoiding that discomfort, we will be using a noseband in her work this year, and it might have been uncomfortable for her if the situation had not resolved itself. The same is true for the wolf tooth, and although we won't use a bit for a long time yet, we will want to introduce it before her next dentistry check-up. Wolf teeth sit right in front of the first molar, and as they are not solidly rooted in, they can be jostled by the bit causing discomfort. The broken tooth removed, along with some decaying food which had become trapped. While Dan was doing this, he also found an imbalance which was already becoming established because Quaramba had been eating differently to avoid her sore tooth, so he balanced her incisors and re-aligned the molars at the same time. She also had some sharp edges, which is normal, but her skin is particularly thin so it had caused some damage in her cheek lining. These edges were smoothed out too. All of this work set her off on her positive spiral again. Djinnie, on the other hand, needed no work at all. She has a naturally straight and balanced mouth and her skin is tough, so there was no need to intervene this stage. She will always be monitored, but if she never needs any work, that is a great thing. Interestingly she was also less compliant about the whole thing than Quaramba, almost as if she is less 'man-made' and she therefore has less sympathy for human intervention! 'Holistic' means Flexibility, Not Rigidity! The difference in the attention given to each youngster was not a difference in approach, it was a perfect example of the whole approach. The whole approach is not looking for one way to treat all horses, but how to make each horse as healthy and happy as they can be. This requires a different attitude in ourselves as human beings. When we want to find a 'one method fits all' way, it is because we want to switch off from each moment when anything is possible, we want to follow simple rules so we don't have to feel and think for ourselves. We want the convenience of distracting ourselves from the task of being the most whole person we can be. This may be convenient, and simple, and appear to give us peace of mind, but it is the artificial and unfulfilling stasis of a stagnant pond. Only riding the waves and feeling the flow of truth can really give us what we are here to find. Each moment of faith and listening brings us closer to that positive spiral, and further from the negative one. The better we can accept the flow, the better we can ride it, and get the most out of the experience. If we had decided that there was no way we could hope to have such fantastic dentistry for all of our horses, and we had convinced ourselves they don't need it anyway, because wild horses don't have it, then we would never have understood this beautiful piece in the whole picture. This happens again and again in all areas, like, for example, trusting that we could take on the expense and the daunting task of finding hoof boots for all of our horses. We have understood again and again that there are no limits outside of those in our own minds, and everything we choose has the potential to become manifest. Part of being in alignment with universal forces is that right-minded intentions are supported in the most powerful way. It is certainly possible to attract those things which feed our ego, but there is a fundamental process we are all part of, which is bringing us all back together, and when we flow with that, we are going downstream, and are supported all the way. So if you feel you are constantly struggling and spinning round in circles, you might need to change direction and go with the voice of truth inside you, and you will find the current again. The holistic ideal is, by nature, a holographic one - that means that it repeats itself on every level, from the large, global scale, right down to the smallest level of things. When applied to equitation, this means that when we take a holistic approach, we will find ourselves drawn to address the whole picture on every level, in every aspect of horse care - and riding and training are no exception. 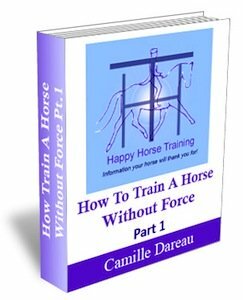 For example, training a horse on the basis of postural engagement - which is the way of riding that results from the intention to ride in true balance and gymnastic harmony with the horse - involves addressing the WHOLE horse's body. In dressage it can be very easy to become focused on certain parts of the picture which are the most 'obvious' - for example the head- carriage, at the expense of developing our awareness of how every part of the horse's body, and our own, are working together. This can be a challenge, because the moving horse and how we influence him/her is a complex biomechanic dynamic. However, the beauty of postural engagement, once we discover how to achieve it, is that it unifies the whole horse's body, channeling the complexity of many different energy 'currents' into one powerful flow. 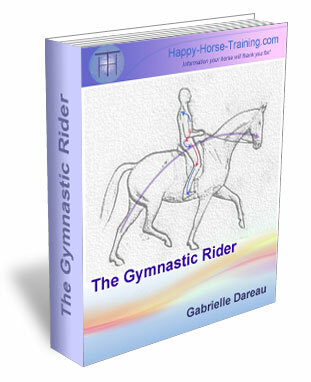 When the whole body becomes connected in movement in this way, ALL the joints of the body are suppled and stimulated with nervous supply, and this is why gymnastic riding is so powerfully therapeutic. Only once we feel this unification, even if it's just for a few seconds at first, can we start to understand the whole picture of gymnastic riding, but we will never reach these glimpses if we allow ourselves to fixate on one part of the picture. This is the leap of faith required by correct riding, and any holistic approach.